May 27, 2012 - Boeing marked another 787 milestone as the first Dreamliner built in South Carolina completed its first flight. Piloted by Tim Berg and Randy Neville, the airplane successfully conducted a five-hour test flight. More than 5,000 Boeing South Carolina employees watched a live broadcast of the airplane as it took off from Charleston International Airport. The production flight test profile tested the airplane's controls and systems in a series of scenarios designed to verify the airplane operates as designed. The tests occurred in all stages of flight beginning prior to taxi, through final landing and taxi. The airplane will be flown to Ft. Worth, Texas to be painted with Air India's livery before returning to Boeing South Carolina for a mid-2012 delivery. The Boeing 787 Dreamliner is a long-range, mid-size wide-body, twin-engine jet airliner developed by Boeing Commercial Airplanes. It seats 210 to 290 passengers, depending on the variant. Boeing states that it is the company's most fuel-efficient airliner and the world's first major airliner to use composite materials for most of its construction. According to Boeing, the 787 consumes 20% less fuel than the similarly-sized 767. Its distinguishing features include a four-panel windshield, noise-reducing chevrons on its engine nacelles, and a smoother nose contour. The 787 shares a common type rating with the larger 777 twinjet, allowing qualified pilots to operate both models, due to related design features. The aircraft's initial designation was 7E7, prior to its renaming in January 2005. The first 787 was unveiled in a roll-out ceremony on July 8, 2007, at Boeing's Everett assembly factory, by which time it had reached 677 orders; this is more orders from launch to roll-out than any previous wide-body airliner. 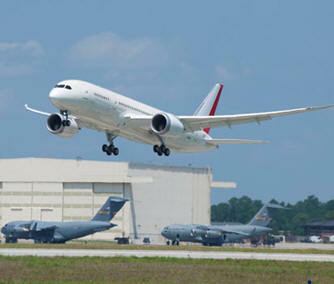 By October 2011, the 787 program had logged 873 orders from 57 customers, with ILFC having the largest number on order.